In the first chapter of Genesis we are instructed that all people are created in the image of God and have been given a mission to have dominion over the animals and subdue the earth (subdue is a translation of the Hebrew kabash, which means here to make the earth useful for human beings benefit and enjoyment). We know, of course, that it was Moses who wrote the first five books of the Bible and, thus, we know something of the time period in which this was done. One interesting fact associated with this is that the concept of bearing the image of God was common in both Egypt and Mesopotamia. However, it was not generally applied to everyone in the way Moses wrote. Rather, only the king was thought to bear the image of God and it was his job to discover God’s will and impose it on the people he ruled over. Thus, when Moses applies the concept to everyone, both men and women, he is making a truly radical statement. He is literally saying that all people are sovereign. In Exodus we see two alternative views of humanity and, hence, of how society is organized. One view is that of Pharaoh who maintains a low view of his fellow man while simultaneously elevating his view of himself to godlike status. This pompous view covets the position of God Almighty who has created everything. The other view is that of God as presented to us through Moses. As our Creator, God can and has delegated to each person the authority to be sovereign over his or her own life. According to this view, each person is required to recognize the image of God in every other person without exception. This changes the nature of our relationships with one another as we will mutually benefit by respecting the rights of everyone. As the biblical story unfolds, we find the conflict of these two views come to a climax in the Exodus. Under God’s direction Moses confronts and challenges Pharaoh who reluctantly capitulates to God after suffering through a variety of plagues. In the end, Pharaoh’s kingdom is reduced to ashes as his arrogance is exposed to the far greater power of the Creator. The Hebrews are led to freedom where they are instructed to live depending on God and accepting personal responsibility for their own well-being. What follows is an ongoing struggle as people generally prefer not to be responsible for their own lives. They would rather be dependent on anyone else but God. To be sure, most believe that it would be ideal to be in a position to lord it over others, and thus, the pursuit of power and control over other people’s lives has been with us throughout history. Indeed, this same misunderstanding of power and position arose among Jesus’ disciples. In the gospel of Matthew, as Jesus is on his way to Jerusalem to be crucified, James, John, and their mother ask Jesus to raise them to power to sit at his right and left hand when he becomes king. It appears that they had not heard when he had continually told them what was about to happen to him. It seems to have fully escaped their understanding that on the way to establishing his kingdom he would endure the cross. So, Jesus rightly chastises them for their request and points out that becoming an overlord for their own glory is not part of their calling. Instead, Jesus tells them that if they want to be great, they must humble themselves before others and aim to serve them, not rule over them. At the last supper, he reinforces this message to his disciples by washing their feet. Once again, we find that God’s way is the way of service that recognizes the inherent dignity of each person and discounts the pompous arrogance of the would-be rulers of this world who only think about promoting themselves and gathering for themselves power and control over other people. Dr. Paul Cleveland is a professor of economics at Birmingham-Southern College. He has authored or co-authored four books. 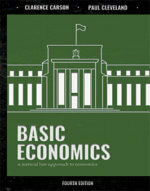 His most recent is an update to Dr. Clarence Carson's economics text: Basic Economics: A Natural Law Approach to Economics, Fourth Edition. Email required for submission, but will NOT be posted.